On any given day, most of us like to be prepared for the worst. But it’s arguable that your wedding day may be the most important day to prepare for any possible surprising occurrence. And let’s be honest, a wedding mishap can feel like the worst kind of disaster. So why take the risk of being unprepared? Are you or is someone you know getting married this spring or summer? An emergency kit makes a great gift for a bride-to-be at a shower or even a creative gift for a bride to give to her bridesmaids. At In A Pikle, this sort of thing is our bread and butter. We love a good emergency kit… we specialize in it, actually! We also happen to love weddings. That’s why we recently introduced the “Something Blue” Petite Pikle to our lineup of compact, adorable, and handy organizer bags. Inside of this cute and itty bitty bag comes our Petite Pak, which also happens to include the main items any bride will want on-hand for her big day. The Petite Pak includes the following: Clippers, bandages, tweezers, scissors, sewing kit, lens wipes, bobby pins, rubber bands, safety pins, paper clips, screwdrivers, hair bands, soap sheets. This is a great start to building the perfect wedding day emergency kit, right? We agree. But maybe you or the bride needs a little more space to include a few additional items. No problem. Any of our Pikle bags will provide even greater organization options AND more space. Anything we missed? Share them with us! 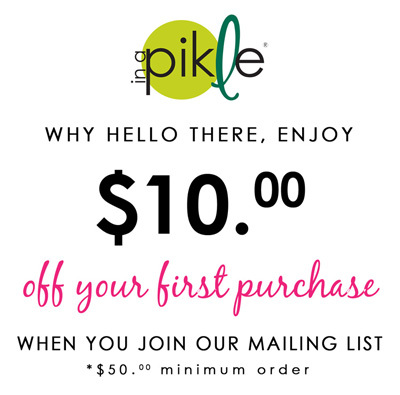 And don’t forget to shop our In A Pikle products as you get ready for all the festivities. This entry was posted in In A Pikle and tagged bobby pins, emergency, kit, marry, scissors, sewing kit, something blue, tweezers, wedding, wedding day.